The Rye Police Department now accepts online payments for many services. Police reports, accident reports, parking tickets, police details, and pistol permit fees may be paid online or in person via credit card or electronic check (ACH). Please review the instructions below for important information before submitting any payments. There are small fees for using the online payment system. These are in addition to the original payment amount for the requested service and cover all processing fees. If you wish to avoid these fees, you can still mail a check or money order. Never send cash. When paying via credit card, there is a 2.9% fee with a $1.50 minimum. When paying via electronic check (ACH), there is a flat $1.50 fee. There is an additional $1.50 fee per transaction when paying online. This fee does not apply when paying in person. Make sure you enter the correct ticket number. Please check your ticket to ensure it was issued by the Rye Police. 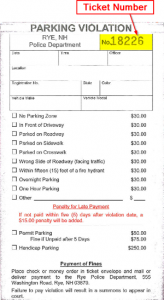 Tickets for metered parking at Jenness Beach are issued by NH State Parks Meter Patrol. If you received a late notice, be sure to pay the appropriate fine including late fees. Must complete report request form first. Once your request is received and approved, you will receive an email with the report number, fee amount, and a link for payment. Defendants requesting an arrest report should file a discovery request instead. Most accident reports are $15, except for those in excess of 10 pages or if you request color or digital photos. Must complete detail request form first. Once your detail request is approved, you will receive an email with the detail number, fee amount, and a link for payment. Since the cost of these details is generally much higher than other services, we suggest you pay via electronic check to reduce your service fee ($1.50 instead of 2.9%). Town ordinance violations must be paid through Portsmouth District Court. If your violation is marked as MUST APPEAR, you cannot plea by mail. If it is marked that you do not have to come to court, you may pay your fine in person or by mail to 111 Parrott Ave. Portsmouth, NH. You may also pay by credit card in person or over the phone by calling 1-855-212-1234. If you have questions regarding any of the above, contact Administrative Assistant Jessica Doucette at (603) 964-7450.